This course is offered on The Dickinson Science Program in England. This course explores cultural, philosophical, and ethical aspects of the interplay between science and society. Particular emphasis will be placed on differences in perspective on scientific issues between Europe and the United States. Examples could include, but not be limited to, topics such as biotechnology, the environment, evolution, and health care, and their past and present representation in the media, literature and art. This course is offered on The Dickinson Science Program in England. This course explores the role of science in environmental sustainability. Particular emphasis will be placed on population growth, biodiversity, renewable vs. nonrenewable natural resources (e.g., water, soil, energy, minerals), and temporal limits of nonrenewable natural resources (e.g., peak oil). Intercultural differences in perspective on sustainability issues will be examined between the UK, EU, and US. A series of activity-based courses in which two topics will be introduced each semester that encompass a range of physical phenomena. Scientific concepts are introduced to provide a basis for understanding of phenomena such as rainbows, cloud formation, global warming, the development of scientific theories, and electrical brain activity. 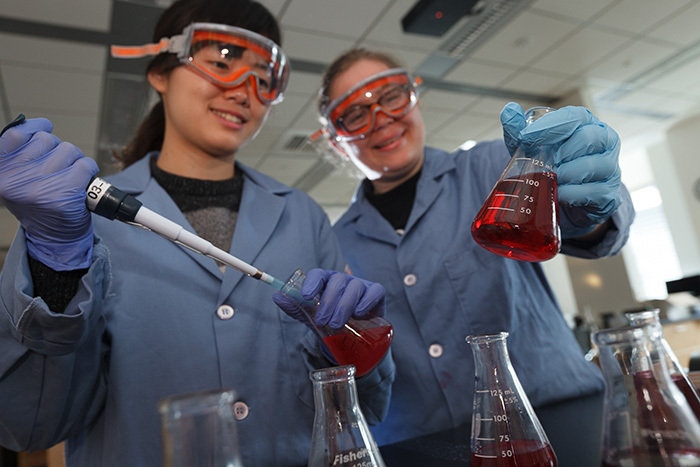 The main emphasis of the course will be on the processes of scientific investigation, with students developing hands-on projects throughout each semester. This course can be taken one or more times for laboratory science credit provided that new topics are covered in each course. The course will meet for a total of six hours each week in a laboratory setting. Science is the human endeavor to understand our world and our universe. However, the popular view of a scientist in the United States traditionally has not been one of a woman. There have been many social and institutional barriers to women who wish to pursue scientific careers. This course will examine these barriers, popular representations of scientists, and the history of women in science in the United States. The first half deals with Greek, Arabic, and Medieval Latin theories of matter, motion, and growth, including the transmission of science and science education. The latter half deals with the scientific revolution from Copernicus to Newton with attention focused on the radical restructuring of basic assumptions about nature and method. Growth of quantitative methods in physical science and experimental methods in biology and natural history in the 18th, 19th, and early 20th centuries. Particular emphasis on Enlightenment and Romantic science, Darwinian evolution and genetic theory, the new physics of relativity and quantum mechanics, and modern cosmology. Gradual separation of science from philosophy and theology. The nature of science as a major aspect of Western civilization. Examines science and the scientific enterprise by devoting particular attention to the following: the structuring of basic assumptions about nature and method; social, cultural, and religious dimensions of scientific change and discovery; noted developments in the physical and life sciences. Topics vary and will be announced each term. Recent topics have included: The Scientific Revolution, History of the Physical Sciences, Development of Cosmology, Science and Religion, Light in Science and Art, and Ethnoastronomy. A lecture course on the role of conventional and alternative energy sources, nuclear energy, and nuclear weapons in modern society. Topics may include the relationship of scientific principles to an understanding of the greenhouse effect, the thinning of the ozone layer, the disposal of nuclear waste, and the technology, effects, and proliferation of nuclear weapons. The senior colloquium in science will explore new developments in science as well as philosophical, social, and ethical dimensions of the scientific enterprise. This will be a team-taught course in which senior science majors will work with faculty members to select readings and lead discussions. One-half course credit. Prerequisite: senior standing with a major in one of the natural or mathematical sciences. Is organic produce really healthier than supermarket veggies? What’s the best way to store produce? Which tea reigns supreme? First-year science students take food questions to the lab.